"I wanted Section 31, the Federation itself, to be the villain. It was this idea that paradise is just a small piece of the puzzle." If you could condense Star Trek into one core principle, you'd probably choose "to boldly go," the grand quest that has been the mandate of all Star Trek TV shows—except one. Riding the warp-trail of the groundbreaking Next Generation, Deep Space Nine first premiered 25 years ago, and the new show chose not to boldly go, but to boldly stay, with the story focusing on life aboard a space station. For many fans this seemed far too static, and the show faced a lot of criticism during its time on air. Yet Deep Space Nine only becomes more relevant as the years go by, as the series had a lot to say about the complacency of utopia—and there are many lessons within the show's seven seasons that we still desperately need to learn, especially if we're ever going to seek out new life among the stars. Deep Space Nine was never going to be a crowd-pleaser, though Paramount certainly wanted it to be. The show was conceived of during Star Trek's golden age: The Next Generation had rejuvenated the franchise while the stars of The Original Series graduated to the silver screen, and fans were eager to see more. Confident in this titan of pop culture, Paramount commissioned a new series to run for seven years. They wanted more of the same. But that's not what Deep Space Nine's writers wanted. "My big thing was how to make it different, not only to The Next Generation but to The Original Series." Ira Steven Behr, Deep Space Nine's longest-running showrunner, is sitting in a small office on the Paramount lot as he tells me this, above the very soundstages where the show was made 25 years ago. He's working on a documentary that will look back on Deep Space Nine, and he's feeling nostalgic. "When the pilot was written and shot, I felt that Michael Piller had created this immense opportunity to really push the envelope." "This wilderness is my home." Underneath the complex socio-politics it would become known for, at its heart Deep Space Nine was a show about ordinary people in an extraordinary situation. Led by the then-Commander Sisko, a traumatized soldier who was a family man at heart, the main cast were far more "lower decks" than Starfleet's best and brightest. And crucially, with a colorful cast of aliens and humans alike, Deep Space Nine was the first Trek series to have non-Starfleet main characters, allowing the show to offer a unique perspective on the Federation—and that perspective was not always as shiny and optimistic as Gene Roddenberry would have wanted. In fact, butting heads with Roddenberry was what inspired Ira Steven Behr to show another side of the Federation with Deep Space Nine. He reminisces about pitching a psychological episode of The Next Generation that examined Picard's fears of aging—and Roddenberry, insistent that Picard felt no such fear, replaced it with an episode about "getting the captain laid." At the time, this aggravated Behr, but it also gave him a great idea. "That's why I wanted to critique the Federation. Because to me, it all sounded like gobble-de-gook, this perfect 24th century… I just didn't understand how we reached that place where life was so damn good. Everything was a song, a beautiful song among the stars, but that's not how I saw it." Over its seven years, Deep Space Nine conducted a thorough investigation of what the Federation really was, throwing its flaws into sharp relief, unearthing dark secrets, and revealing a Starfleet that was unafraid to fight dirty when threatened. This may seem contrary to Star Trek's values, but this critical outlook came from a place of love. Behr compares Deep Space Nine's relationship with The Next Generation to Mark Twain penning Huckleberry Finn after Tom Sawyer. "You can love that society but at the same time you critique that society. So I said okay, let's take this thing everyone loves, the Federation, let's see out how it works, what's strong about it, what are its weaknesses, and why it's worthwhile." Behr and the other writers approached Star Trek with a grounded realism, looking back on The Next Generation's neat diplomatic solutions and asking themselves what would really happen. In one such plot, Behr found his "clarion call" for the show, as Deep Space Nine explored the rise of the Maquis—a group of settlers displaced in The Next Generation,who fought back when their homes wound up on the wrong side of a relocated border. In one oft-quoted scene, Sisko defends this rebel group, arguing that Starfleet can't understand the desperate actions of the Maquis because "It's easy to be a saint in paradise, but the Maquis do not live in paradise." But Deep Space Nine wasn't content with revisiting plot points from The Next Generation, and as tensions with the powerful Dominion continued to rise, the writers went where no Star Trek had gone before: They took the Federation to war. The Dominion War arc was Star Trek's first truly serialized narrative, a six-parter born from five years of foreshadowing. But for Ronald D. Moore, co-showrunner who later created the hugely influential Battlestar Galactica, the Federation's path to war started long before Deep Space Nine began. "It felt like war had been talked about forever in the Star Trek universe. Literally since The Original Series there was always the threat of war—over and over again, the Federation was about to go to war but it never happened." When season six of Deep Space Nine rolled around, happen it did, as the writers forged the most brutal and devastating conflict the Federation had ever known, resulting in the deaths of seven million officers and countless civilians. Although this call to arms demonstrated why the Federation was worth fighting for, it also exposed the heart of darkness lurking within. Such was the introduction of Section 31, a shady secret service dedicated to performing all kinds of necessary evils to ensure the apparently virtuous Federation could stay afloat. As Behr explains, "I wanted Section 31, the Federation itself, to be the villain. It was this idea that paradise is just a small piece of the puzzle." With Section 31 never unveiled to the wider Federation, Deep Space Nine left audiences hanging on what this organization meant for Roddenberry's vision. As Moore puts it, "Utopia is an ideal, it's not achievable. There's an idea of humans striving towards perfection and never quite able to achieve it, and Section 31 is emblematic of that." For such a franchise-shaking idea, it's a shame that Section 31 was introduced as an afterthought in the penultimate season—yet as unresolved as this plot point is, of all Deep Space Nine's commentary it is perhaps the most relevant to today. After The Next Generation preached about how humanity's problems were solved, Deep Space Nine argued that utopia is not the end of the story, that in order to achieve Roddenberry's humanitarian values we must be constantly vigilant, unafraid to challenge societies that seem perfect, especially if those societies offer us a comfortable life. Yet while complex examinations of utopia might be perfect for today's prestige TV, this topic was harder to swallow in the '90s—and to say that Deep Space Nine was unappreciated in its time truly is an understatement. Deep Space Nine's unflinching examination of what was dear to fans' hearts earned it the moniker of "the dark Star Trek", and viewing figures dwindled throughout its original run. Looking back on playing Major Kira, a resistance fighter turned reluctant peacekeeper who would feel right at home on TV today, actor Nana Visitor told me why fans found it difficult to get into Deep Space Nine. "It was hard for people to catch up and understand what was happening; they were used to Star Trek being standalones." Back in the '90s most TV was watched live, and as Deep Space Nine got more complex, missing an episode meant losing track of the plot. This was far from what Paramount had envisioned for the series, and as Ira Steven Behr reveals, there were many battles between the network and the writers. "We were told we were destroying the series by serialization, we were destroying Gene's future by introducing war and money, we were losing fans because they couldn't get into the show, we had no chance of getting new fans because they would watch one episode and give up. A lot of it was negative." "We were told we were destroying the series by serialization, we were destroying Gene's future by introducing war and money..."
Yet there were those who deeply loved the show. Kira, in particular, became a symbol of hope, her survivor's story paralleling those of anyone who has been oppressed. Visitor reflects on a time when one such survivor spoke to her: "There was a much older woman who came to a convention once. She simply raised her sleeve and showed me the numbers tattooed on her arm, and said what my character meant to her. And that was overwhelming and a sock in the gut." "What kind of people give those orders?" Despite Paramount's misgivings, Deep Space Nine impressed not only fans of scifi, but also its creators, as Moore reveals: "When I'm working in the business and we're talking on other projects, Deep Space Nine comes up a lot in terms of influencing other writers and directors and their ideas of what you can do in science fiction and how you could take science fiction seriously." Considering the impact of Battlestar Galactica, which was conceived of during Moore's time on Deep Space Nine, it's easy to see how modern TV carries on the legacy of Star Trek's black sheep. Thanks to being added to Netflix, Deep Space Nine is currently experiencing a renaissance. "Binge-watching is the best thing that ever happened to Deep Space Nine," Behr enthuses, "it's made the show accessible in the way it was meant to be seen." But beyond its binge-watch potential, Visitor has a different theory about the show's new heyday. "We might as well be on a space station now, with a bunch of aliens shoved together, and we all have opinions and problems, and everyone thinks they're right. I think it speaks to now." Although Deep Space Nine ventured to far darker corners of the Federation than any Star Trek had gone to before, Behr refutes the idea that it was a dark show. "I would like to think that it spoke to the better angels of our nature. That if you watch it with all the war and death and lies, it speaks to bringing us closer together rather than tearing us apart." In the end, Deep Space Nine is about endurance, and rebuilding after conflict. Visitor believes that choosing love over hate is the core message of the show: "sometimes all we need is time. Kira learns along the way that there is pain, but the suffering is optional." And what's more true to Star Trek's values than that? "Everything was a song, a beautiful song among the stars, but that's not how I saw it." When he first set out to create Star Trek, exploration was not what Gene Roddenberry envisioned as humanity's ultimate goal, and he said as much himself: "Star Trek was an attempt to say that humanity will reach maturity on the day that it begins not just to tolerate, but take a special delight in differences in ideas and differences in life forms." Yet, as with many of Roddenberry's ideals, this philosophy isn't quite so simple to put into action. For Moore, that is the core message of Deep Space Nine. "Diversity is complicated. It's complicated to put together a diverse group of people and have them get along. They all bring a lot of different cultures and values, and it's not so easy to say okay, we're all gonna have the same set of values and elevate this one set of ideas." 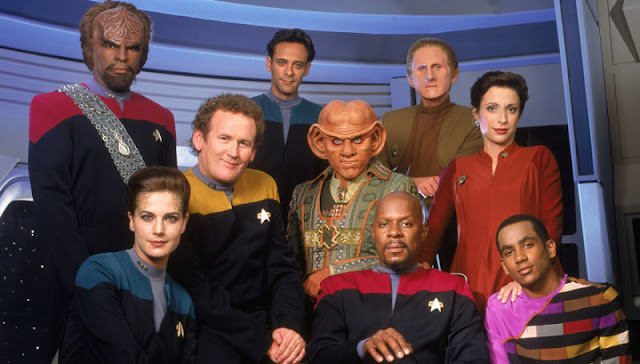 For Deep Space Nine, there was no need to no boldly go, no need to seek out new life and new civilizations, because they were all right here, living and working with Starfleet officers, sharing all their victories and defeats. Despite being seen as an outlier, this "dark" Star Trek might just be the most true to Roddenberry's vision because it challenges us not to be complacent in utopia, but to keep embracing diversity and broadening our perspectives—and if we do this, then we can build a better Federation.